The ribs were thicknessed to 1.8 mm first and then coaxed into their curves using a bending iron. 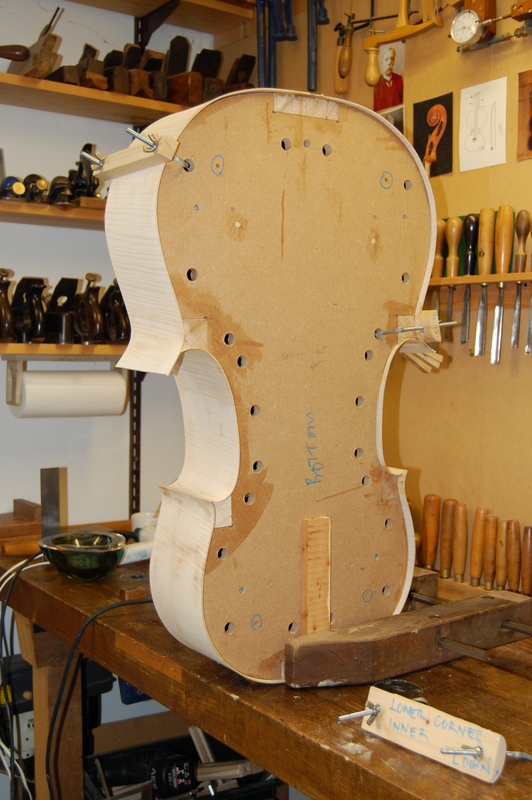 Because this is a baroque cello, when the neck is fitted, it won’t be mortised into the top block but simply glued and nailed into position. So, to add strength and minimise the risk of the top block splitting when the nails are driven in, I used a continuous piece for the ribs of both upper bouts to avoid having a join at the top. 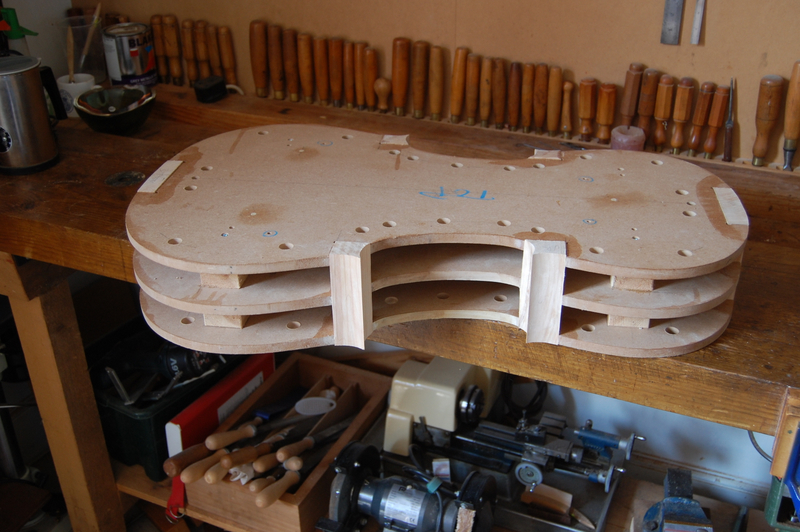 Here are a couple of photographs of the ribs being glued into position around the mould. 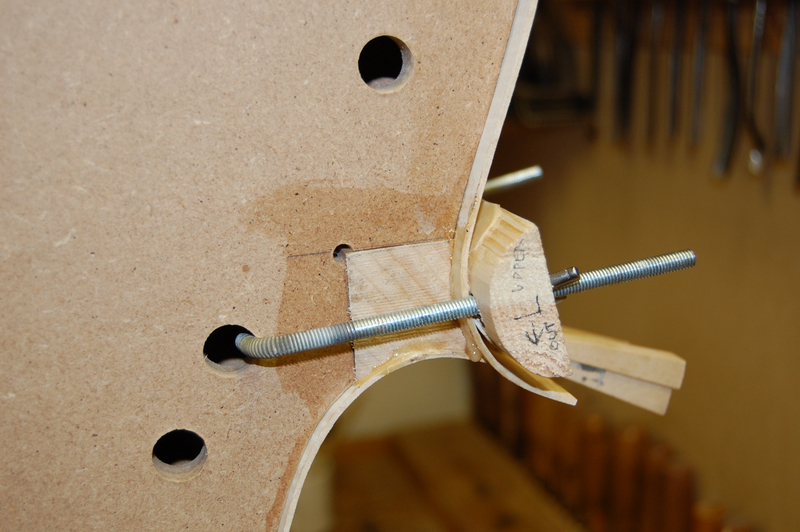 Some of my earliest posts when I started this blog at the beginning of the year were about making a clavichord. I recently went to see David Condy, who had commissioned the instrument, and had the great pleasure of hearing him play it. Although an accomplished pianist and organist, he told me that it had taken him a little while to get used to the different action of a clavichord keyboard. As you can hear if you click on the pieces below, he has succeeded magnificently. 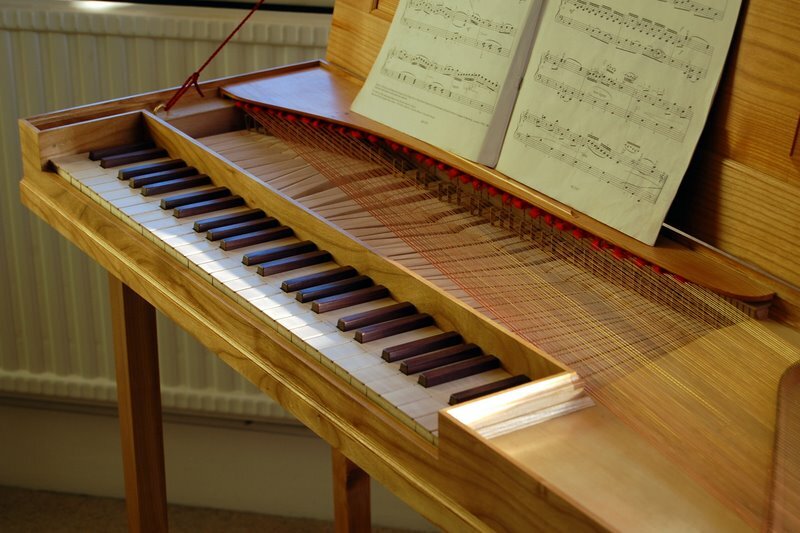 Clavichords make a beautiful but rather small sound, so don’t turn the volume up too high. He’s playing a piece from Sweelinck’s Liedvariationem für Klavier, called Unter der Linden grüne. The first is just a snippet for anyone who wants to hear what a clavichord sounds like. The second, which lasts a little longer, comprises the theme and the first two variations. Click on the blue titles below to hear them (or use the audio player in the bar). A friend of mine, a writer by trade, but also a talented amateur musician, has asked me to make him a cello. He plays in a baroque ensemble and his current instrument, which has a modern set up and metal wound strings, doesn’t make the right sort of sound for music of that period. Although I was delighted to be asked, I’d never made a baroque cello before and I needed to do some research before starting. It turns out that accurate information is hard to come by. Any number of books and websites will explain some of the differences between a baroque and a modern instruments: the lack of an end pin, the shallower neck angle, the broader and shorter fingerboard and the lower bridge. While this is all correct, it’s not detailed enough to be of much use to a would be maker. However, I’ve found out most of what I need to know through the generosity of an experienced professional cello maker who has made lots of instruments in the baroque style and who patiently explained what’s required. Thanks to his advice, I feel confident enough to make a start. 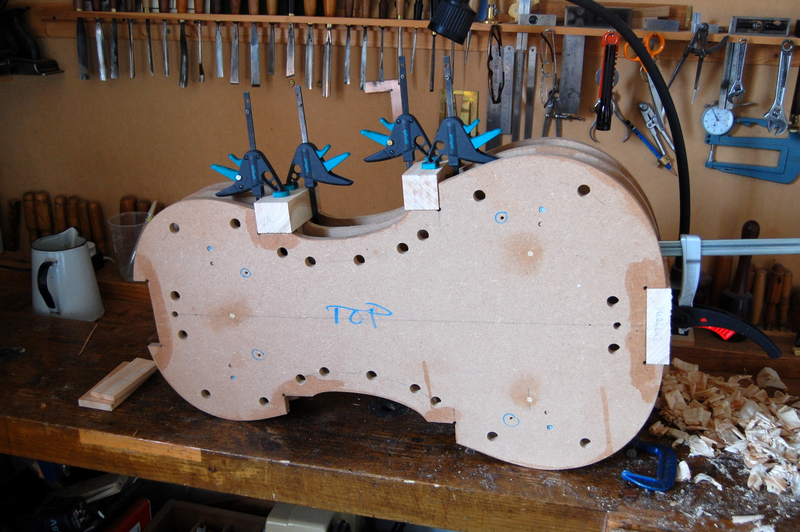 I’m going to re-use the three layer mould based on the Stradivari Forma B that I made for my last cello. Here are the corner blocks (willow) being glued into position. And here they’ve been shaped, ready for the ribs to be glued in place.